Let’s talk about what no one tells you about motherhood. No one tells you exactly how incredibly hard it is. No one alludes to the depths of exhaustion, mentally and physically, it can take you to. No one says how you just wake up one day and have no idea who you are. And then, I knew nothing about me. I knew who I was (and if I’m being honest that was wavering because I defined myself by who I wanted to be; I was very much trying to put my finger on the pulse of me while chasing the next adventure. Then “pregnant” appears 27.6 seconds after peeing on a stick.). I’m not sure if you have ever been there, but this is, I’m sure, where the tread meets the pavement. I would go to my closet and have no idea how to dress. What did I like? What was appropriate? What fits? Does this match? And then I would give up. I meal plan according to the needs of my family. I had no idea what I really liked to eat. What food just made me happy and smile. I knew what I could eat. I was very aware of what available to me and if I wanted to eat it but what I loved? Not a clue. Friends, not even an inkling. TV Shows? I’ve always said ‘Greys Anatomy’ is my longest committed relationship. Outside of that, I watched TV for a mental escape so I honestly can’t tell you if I looked forward to these shows because I loved them and they were so great or because I didn’t want to think or feel things about reality. I can tell you when episodes would maybe hit a little close to home, I wasn’t feeling that episode. Beauty products? For what? I mean, is there more to life than EOS lip balm I share with my kids? Self-care… stahhhhhhp. So, post-break-down, I started doing the work to know me, who I am right now, in all the mess and all the glory. Guys, it wasn’t pretty. It is a far cry from a work of art now. But I have things I know I like. That is HUGE! I’m also building my personal principles that will do what? Define me! Yay! What is crucial to know- I am still, very much so, an all-in mom. I just learned that me being an “all-in mom” does not mean that I can’t be an all-in human. I don’t have to stop being kind to myself to show love to my kids. Crazy I’m just figuring this, right? I know. But guess what? I’m building a “My Favorite Things List” to share with you because those aren’t exclusively reserved for the likes of Mother Oprah. So, if you are new here, I am a homeschool mom. This year, I am homeschooling 2 preschoolers. Thus, updates were greatly needed. The first thing we needed to maximize was space. One of the reasons I chose to homeschool was individualized lesson plans and one-on-one learning. I don’t think you can do that without space to learn. That meant re-organizing what we already had, removing some things and adding a few things (I know adding things doesn’t make sense but go with me). Don’t hate me. I got rid of the train table while my children were sleeping. Yes, I waited until they were sound asleep, dismantled it and put in the garage and the immediately gave it away. There was an adjustment period of maybe 12 hours. Why? That’s simple. Valuable real estate. That thing was freaking huge. Plus, the kids didn’t use it properly. Train tracks, trains, cars and whatever else were always flying and my kids would not stop crawling up on to the train table. It was no longer safe…for my sanity, of course. So, off it went. Man, oh man. The joy of that space. To start, for me, meant evaluating our space and seeing what works for us. I new our circle time wall and safe space for reading and calm down time worked and worked well. Our art table is very close to the bathroom and that works very well (easy access to handwashing is a must!). What didn’t work was our lack of storage. So, I took the cubby organizer we got from Ikea from its horizontal position and placed it vertically. BAM! Not only did that make the cubbies more effective for children to access their toys, it gave two cubbies AND a shelf to store curricula supplies and supplements. What???? I also moved our world map to a blank wall that was lower, giving my children more visual and physical access. The cars, trucks, planes, etc. from the train table I placed in storage bins and totes under our bench in the learning room. I added a map of the USA (Dollar Tree). Geography and map studies are going to be a big focus for us this year and I wanted constant visuals of this. I also added a small table from Ikea (who doesn’t love Ikea???) in order to have to learn/work spaces for my boys because …frenemies. #thestruggleisreal I also made another art display because double kids equal more art to show off. I thought I was done and then… Target dollar spot got me. 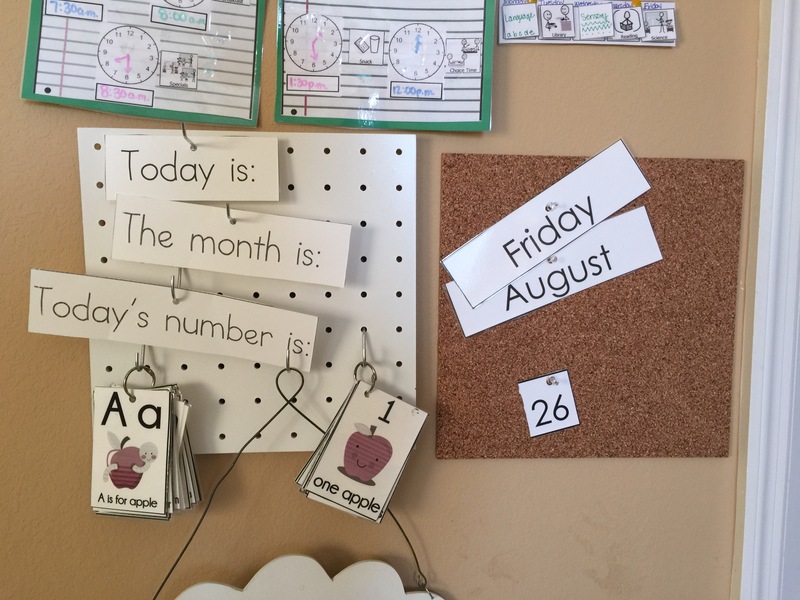 I bought two more pocket charts to display our visual schedule and one for WORD WALL. What in the actual world, people??? That’s it! Any suggestions for me? For pics, check out my facebook page! You can also keep up with my (almost) daily ramblings about life. That was more for me than you. Stating the obvious, it has been quite some time since I put pen to paper and released my thoughts to you. It was intentional. Most certainly not because I didn’t want to or that I’d moved on to bigger and better things, it was simply because I couldn’t. I had a baby…I had 2 boys under 2. I was engulfed with postpartum depression and anxiety and in a grungy survival mode. Everything I did was simply to make it to the next hour. Hours, days and months passed and I was still just surviving. Barely, at that. Then, my youngest wouldn’t talk and although I’d noticed and documented my sensory concerns and he started OT at 10 months, him literally not saying one word freaked me out. So, suddenly I had 2 special needs kids. You should know I had no idea the toll that would take on me. Somehow, I made up that since I had one, I was a pro and knew the ropes. You know, the “I got this” mentality. You should also know what I made up was very incorrect. I also didn’t involve my heart in these matters. I didn’t have time to feel and, if I didn’t feel anything, then there wasn’t anything to work through and definitely no need to cope. Again, I made up that I didn’t have time for it anyway so, why bother. Head down and get to work. Somehow, that worked, until it didn’t. Without feeling or really thinking I was managing 4 different therapy appointments, continuing exercises from therapies at home, homeschooling, not sleeping, not exercising, barely eating, forcing myself to get out of bed every day, and hating so so much of this so-called life. It sounds so cliché but I honestly had no idea was who this empty person was staring back at me in the mirror. I lived on coffee, Malbec, and Xanax. Now, I’m sure you’re reading this and expecting a big ‘Aha Moment’ to come next. Spoiler Alert: It does not. Back to the breakdown, I’m not sure how it happened…what sparked it… how I got to that point of allowing myself to feel but I remember laying on our sofa talking to my husband and then all of a sudden thinking the roof was leaking. (You should know that it is late March and in 6 months we had a leak, our heat broke, I put a hole in the garage wall, our fridge went out and our microwave broke so, a roof leak was par for the course.) I looked up, no leak that I could see. “Why is my face wet?” I asked myself. Then, the scene from “How The Grinch Stole Christmas” happened in my living room and I said to myself, “I’m leaking!” Not crying because I don’t have time for that. I truly believed I was leaking. Sad, I know. Anyway, my heart came out of hibernation and reminded that I was, in fact, crying. Now everything from that moment to my husband carrying me upstairs shaking is a blur. I have no idea what took place but I know I emptied everything I’d been carrying in that anxiety bag. I also unloaded the depression suitcase that was way past any airline weight limit. I don’t have my list of what makes me happy complete. I know I like to exercise and I like to write. I love to read. So, I started reading again and I loved being filled with good things. I started exercising again and I love giving to me. I just started writing again and it felt good. I missed this and I missed you. Some of you remember my birth story with my oldest son, James. After reading this, you will truly understand how every birth is different. Let start from the top, shall we? My pregnancies were the same until 30 weeks and then this one went left. I had pain galore that, of course, I couldn’t do much about as it was intestinal (in opposition to the back pain and nausea I had with James). I was also way over pregnancy. Way. Over. Contractions!!!! Hard, fast and regular contractions. #babyontheway They lasted for an hour or two. Then they went away…after I called my husband and called a sitter…just great. Then, much later that night, could it be? Would it be? Yes!!!! Sweet Lord, YES! More contractions. Consistent, close together (4 mins a part) contractions and I lost my mucus plug! Woohooo! My contractions were never that close with James so off to triage we went with hope and expectation in our hearts only to find out I was only 1.5 cm dilated. We walked like our lives depended on it for 2 hours. I even beared down and pushed with contractions and then… nothing. “No change unfortunately” according to the nurse. I’ve never felt defeat like that. I cried a quiet, whole-body-shake sob while my husband held me and told me it was going to be ok. I did get one victory out of that night-muscle relaxers because ain’t nobody got time for meaningless contractions. So, basically any time I moved contractions would ramp up in intensity and in quantity. If I laid on my side I could keep them 10-20 minutes apart. For 2 days this was my life. It was miserable. I was miserable. Fast forward to Christmas morning-a contraction woke me up at 6 a.m. that made me wake up my husband. Laying down couldn’t stop the contractions or keep them as far apart. Moving made them way more intense and close together. I laid down as much as I could. Around 7 p.m., they had a mind of their own. They just kept coming, anywhere from 4 to 15 minutes apart. Then, just one hour later, a contraction came that I couldn’t just breathe through and had to moan. Then, another one, same thing, except a gush of fluid I wasn’t familiar with came and kept coming. My water broke. My gut told me I need to leave now. With James, my water broke about 20 minutes before I was crowning and I live about 20 minutes from the hospital. My mind, always one for tricks, said “it’s ok. You’ve got time. You’ve got this.” I listened to my mind. 10 minutes later when I couldn’t even walk because the contractions were so close together and I felt all the pressure, I listened to my gut. In the same 10 minutes, my husband somehow got James ready for bed and asleep as well himself dressed. Then, he got me dressed, gave the neighbors watching James (on the monitor) the run down and we were off. I couldn’t sit in the seat. I said to my husband, “Babe, turn on the hazards. This is your NASCAR moment.” I still don’t know how many lights he ran. Some minutes later, I’m in a room in L&D and get checked again, I’m 7.5-8 cm and wouldn’t ya know it, moving too fast to get drugs. Now, I move too fast??? 3 days of labor and now we move fast. So, naturally, I assume this is the end and I’m going to die. No one can make it through this. Something is gravely wrong the medical staff just hasn’t discovered it yet, I think. I felt like this was moving so quick to save it’s own life. Knowing my fate, I then throw up. Bless Nurse Chelsi who caught it just in the nick of time. PAUSE: Can y’all imagine contractions lasting 4-5 minutes?? I can’t and I went through it. Also, they were literally off the charts. I knew death was chasing me and closing the gap. PLAY: Then I felt a different pressure. I’d already pushed 3 times without permission. The nurses said I could push with the next contraction, that, of course, was on the heels of the last one so I did and then HOLY RING OF FIRE!!! Somehow, because this contraction won’t stop neither do I and I keep pushing. Then, I push again. I feel like everyone is telling me to stop. They keep calling my name and trying to get me to look at them-the nurses, my husband, they are all trying to tell me to stop but there was no way. If I’m gonna die it needs to happen sooner rather than later, I thought. My husband gets my attention and says very clearly, “Pull him out!” Ohhhhhhh. That’s why everyone was calling my name. On Christmas night, at 9:54 p.m., less than 1 hour after we got to the hospital, less than 2 hours after my water broke, with ‘Make You Feel My Love’ playing, I delivered Jude Lawrence. Then, I engaged in casual banter with the nurses. I apologized. They were full of grace. The doctor doesn’t know it but we are homies. He was super cool and calm and was real “whatevs” but super professional and efficient at the same time. I saw him out of the corner of my eye during one of those “contractions” (we can all agree that what I endured should be called something else) and yelled, “I want to pull him out.” I’m pretty sure his response was “cool”. That, my friends, was a merry Christmas night indeed. So, if at first you don’t succeed, try again, right? Well, that’s what happened. Two weeks into school and I realized James had a hard time changing the calendar information. So, off to many stores I went. Finally, at Walmart found some cork tiles and wall mounting tape. Then, the Internet didn’t let me down and found these printables to describe the calendar information for the peg board. I broke my laminator so I couldn’t laminate them. Let’s have a moment of silence. Then I got 3 push pins because my son can do that-he can push the pin into the cork tile.